Colorectal cancer (CRC) is one of the leading causes of cancer-related death worldwide . The improvement in individualized treatments calls for refinement of the subtypes’ classification of cancers based on their histological characteristics and genetic features. The most common histologic subtype of CRC is adenocarcinoma, of which mucinous adenocarcinoma is a distinct subtype and is characterized by abundant mucinous components that comprise of at least 50% of the tumor volume . Statistics suggest that 10%–20% of CRC patients are of the mucinous subtype [3, 4], but this rate has been observed to be lower in Asian countries and higher in Western countries [5–8]. In regard to the clinical pathology, mucinous colorectal adenocarcinoma is found more frequently in the proximal colon than in the rectal or distal colon [4, 9, 10]. The ratios of female and younger patients with mucinous colorectal adenocarcinoma are both higher compared to non-mucinous colorectal adenocarcinoma [11–13]. Moreover, mucinous colorectal adenocarcinomas are more frequently diagnosed when they are already in advanced stages and they usually have poorer responses to chemotherapies as compared to their non-mucinous counterparts [14, 15]. Molecular assessments have revealed significant differences between mucinous and non-mucinous colorectal adenocarcinoma, suggesting a different mechanism of oncogenesis. Overexpression of the MUC2 protein is one of the most evident molecular aberrations that distinct mucinous colorectal adenocarcinoma from its non-mucinous counterpart [16–19]. Mucinous colorectal adenocarcinoma is also associated with a high frequency of microsatellite instability (MSI-H), which correlates with Lynch syndrome  and mutations that pass through the Ras-Raf-MEK-ERK pathway (RAS/MAPK pathway) . However, the factors involved in the development of the mucinous colorectal adenocarcinoma and their prognostic implications are not yet well understood. Further, there is a persisting debate in regard to the prognosis of mucinous colorectal adenocarcinoma as compared to its non-mucinous counterpart. Some studies have found that patients with mucinous colorectal adenocarcinoma have a lower progression-free survival (PFS) rate (3-year PFS rate, 79.2% vs. 56.9%, respectively) and a shorter median OS (60.2 months vs. 48.4 months, respectively) [22, 23]. However, others have shown that the mucinous colorectal adenocarcinoma histology itself had no correlation with prognosis. For instance, a population-based analysis consisting of over 120,000 colon cancer patients in Europe demonstrated that mucinous colorectal adenocarcinoma histology had no negative impact on survival . In contrast, Japanese investigators found that mucinous colorectal adenocarcinoma was associated with poorer survival compared to non-mucinous for patients with stage III and IV diseases . Hugen et al. suggested that poor prognosis for mucinous carcinoma only existed in rectal cancer but not in colon cancer. Furthermore, a meta-analysis consisting of 44 studies comprising of over 220,000 patients indicated a poorer prognosis for patients with mucinous colorectal adenocarcinoma histology when the stage at presentation was adjusted . Till present, the prognostic value of mucinous colorectal adenocarcinoma remains undetermined when the locations of the tumor, molecular alterations, population characteristics, or different treatment plans are taken into account. 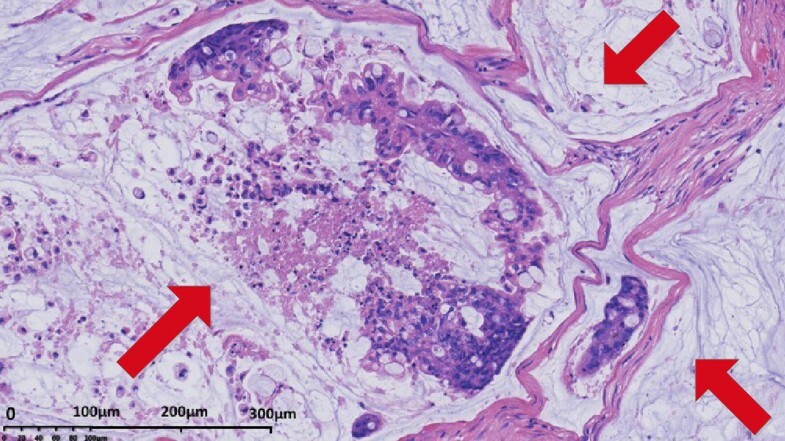 However, it is worth noting that signet-ring cell carcinoma, another subtype of adenocarcinoma characterized by abundant intracellular mucin such that their nucleus is displaced aside, has shared molecular features with mucinous colorectal adenocarcinoma, including the presence of MSI-H, CpG island methylator phenotype-high (CIMP-H), and frequent BRAF mutations . It has been reported that compared with colorectal adenocarcinoma and mucinous colorectal adenocarcinoma, patients with signet-ring cell carcinoma were more frequently associated with metastatic disease, metastases at multiple sites, and had a poorer survival than mucinous colorectal adenocarcinoma patients [27–29]. A study by Inamura et al. showed that even when less than 50% component of signet-ring cells were present in the tumor, they could still serve as a poor prognostic indicator in CRC, independent of other clinicopathological features. Several molecular alterations as described below, are related to the occurrence and prognoses of mucinous colorectal tumors. The third molecular change that results in MSI involves mutations in the fundamental genes of the RAS/MAPK pathway, such as B-Raf proto-oncogene (BRAF) and v-Ki-ras2 (KRAS) mutations. BRAF and KRAS are both components of the RAS/MAPK pathway, and activation of this pathway promotes cell division and reduces cell apoptosis . Compared with wild-type KRAS carcinomas, KRAS-mutated tumors were more frequently located in proximal colon and have shown an increased frequency in mucinous differentiation [47–49]. Tumors with high mucin production have greater frequencies (65%) of KRAS mutation than tumors without mucin production . Further, approximately 75% of BRAF mutation tumors contain a mucinous adenocarcinoma histology, which is more frequent than BRAF wild-type and KRAS/BRAF wild-type tumors. It has also been reported that BRAF mutated patients were associated with adverse histological features and had a significantly shorter median OS of 11.0 months compared to 40.6 months for BRAF wild-type patients [49–51]. Recent researches have focused on BRAF V600E for its role in MSI status and its prognostic implication. The BRAF V600E mutation is the most common BRAF mutation, of which accounts for approximately 90% cases and it is reported to be associated with features such as proximal location, MSI, and mucinous adenocarcinoma components . Moreover, the BRAF V600E mutation is strongly associated with sporadic origin in MSI-H cases and poor prognosis in advanced CRC [52, 53]. Thus, alterations in the fundamental genes of RAS/MAPK pathway could lead to MSI and are more likely to associate with mucin production, proximal location, and mucinous adenocarcinoma histology than wild-type patients. Multiple clinical trials have been performed to evaluate the prognostic value of mucinous colorectal adenocarcinoma histology. Although mucinous colorectal adenocarcinoma is different from non-mucinous colorectal adenocarcinoma in terms of gene expression and histology, the standard treatments for colorectal adenocarcinoma are recommended to mucinous colorectal adenocarcinoma patients since no clinical guidelines have been developed specifically for this group of patients. It was reported that patients with mucinous colorectal adenocarcinoma was less responsive to neoadjuvant and adjuvant chemotherapy as compared to those with non-mucinous colorectal adenocarcinoma, due to the mucinous colorectal adenocarcinoma histology [60–62]. As elaborated, mucinous colorectal adenocarcinoma patients had lower OS rates when they received the same therapies as non-mucinous colorectal adenocarcinoma patients. Consequently, specialized treatment plans for patients with mucinous colorectal adenocarcinoma histology are necessary. Bevacizumab and cetuximab are two drugs that are commonly used in targeted molecular therapy for advanced CRC patients. Cetuximab is an anti-epidermal growth factor receptor (anti-EGFR) antibody and is often used in combination with chemotherapy. Currently, a small number of studies have investigated the treatment prognosis for cetuximab in mucinous and non-mucinous colorectal carcinoma patients with wild-type KRAS. Evidence suggested that for CRC patients with left-sided tumors, chemotherapy plus anti-EGFR antibody therapy demonstrated an enhanced outcome (HR, 0.75; 95% CI 0.67–0.84; P < 0.001), while the same regimen exhibited no significant benefit for CRC patients with right-sided tumors (HR, 1.12; 95% CI 0.87–1.45; P = 0.381) . Venook et al. showed that when the target tumor was located in the right colon, which is commonly found in mucinous colorectal adenocarcinoma, patients in the bevacizumab-chemotherapy group had a median OS of 24.5 months, while patients who received cetuximab-chemotherapy had a median OS of 16.4 months. Further, a nationwide population-based study indicated that the addition of bevacizumab to chemotherapy was associated with longer OS than palliative chemotherapy alone (HR, 0.7; 95% CI 0.64–0.83) in CRC patients with peritoneal metastasis . However, no significant difference in OS was found in KRAS wild-type advanced or metastatic CRC patients between the addition of cetuximab versus bevacizumab to chemotherapy as a first-line treatment (HR, 0.88; 95% CI 0.77–1.01; P = 0.08) . A study on ovarian mucinous adenocarcinoma showed that cetuximab inhibited the growth of tumor cell lines lacking KRAS mutation, but could not inhibit the growth of mucinous tumor cells carrying a mutation in KRAS gene . Few comprehensive clinical studies have investigated the effects of targeted molecular therapy in patients with mucinous adenocarcinoma histology, but there were some which have been reported in mucinous ovarian carcinoma [75–79]. 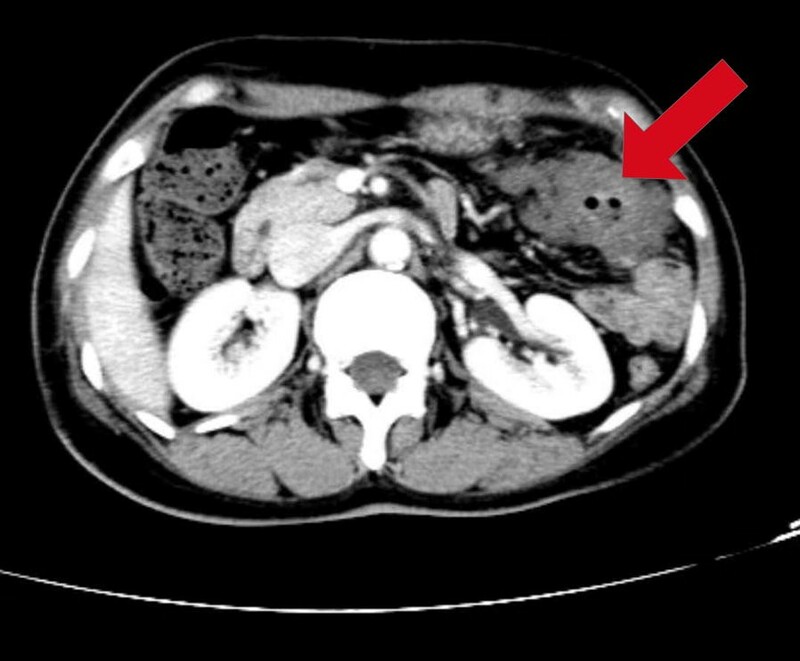 It was shown that a woman with a locally advanced mucinous colorectal adenocarcinoma in the transverse colon who was treated with 4 months of palliative metronomic capecitabine with bevacizumab, subsequently underwent radical surgery and the treatment intention was changed from palliative to curative. This evidence suggesting the potential use of targeted molecular therapy for mucinous colorectal adenocarcinoma patients . In this regard, targeted molecular therapy is only recommended for stage IV metastatic CRC patients but not stage I/II/III postoperative patients, due to insufficient evidence in literature. Bevacizumab is advised for patients with right-sided tumors or RAS-mutations. For mucinous colorectal adenocarcinoma patients with left-sided tumors, bevacizumab could be used as a first-line of treatment, and cetuximab as a second-line of treatment but if the treatment fails, then regorafenib could be used as a third-line of treatment. Bevacizumab could also be considered as first-line treatment for CRC patients with peritoneal metastasis. As the tumors with mucinous colorectal adenocarcinoma histology are more likely to be located on the right side of the colon in patients with KRAS mutations, we suggest using bevacizumab as the first choice for mucinous colorectal adenocarcinoma. Mucinous colorectal adenocarcinoma is associated with a higher rate of MSI-H. It has been proven that cancer patients with MMR/MSI-H tumors are more likely to benefit from anti-PD-1 therapy, and similar results were observed in MSI CRC patients with 31.3% patients achieving an investigator-assessed objective response and 69% patients having disease control for 12 weeks or longer [90–92]. MSI CRC only accounts for about 15.0% cases of all CRC, yet the fact that mucinous colorectal adenocarcinoma is associated with higher rate of MSI-H implied mucinous colorectal adenocarcinoma as a good candidate for PD-1 inhibitor treatment. However, Kim et al. suggested that in MSI-H CRC, the presence of mucinous colorectal adenocarcinoma was associated with a poorer response to PD-L1 as compared to patients lacking the mucinous component.